When Louis Kahn received the commission to design the Monument to the Four Freedoms in September of 1973, the baseline he used for the architectural assemblage was 9” inches above the established mean high tide. By the time the project was constructed and opened to the public on October 24, 2012 the design had been adjusted to reflect the new world reality: the baseline had to be raised 15” above the old MHT. The new datum was already making itself felt. Days later, Hurricane Sandy made the fluctuations tacit. As a response to the billion dollar losses in the aftermath of Hurricane Sandy, Rebuild by Design sponsored a competition to study alternative ideas for making New York City both more defensible against future damage and more resilient in the event the city sustains such losses again. One of the six winning entries was a project from the Danish firm BIG. 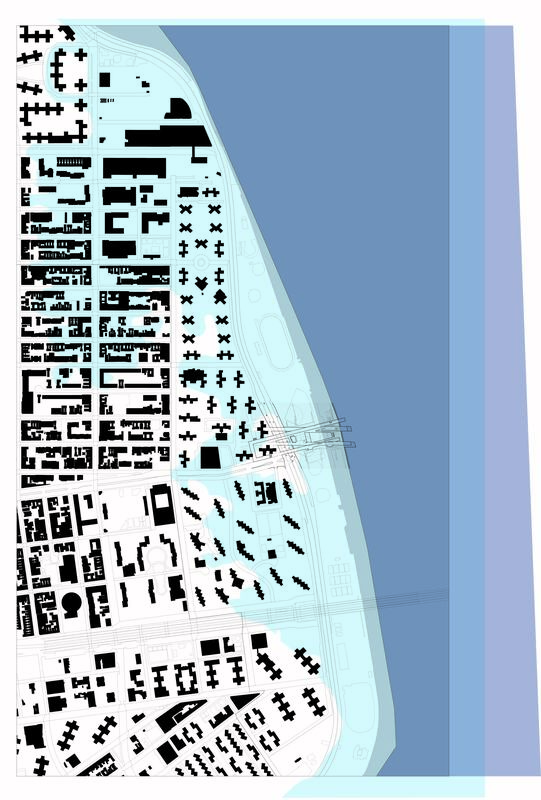 The project proposes a fortified line (a thick edge) 10 miles long defined by the limits of NYC’s Hurricane Evacuation Zone 1 that would help protect Lower Manhattan from the catastrophic infrastructural and economic losses associated with storms like Sandy. 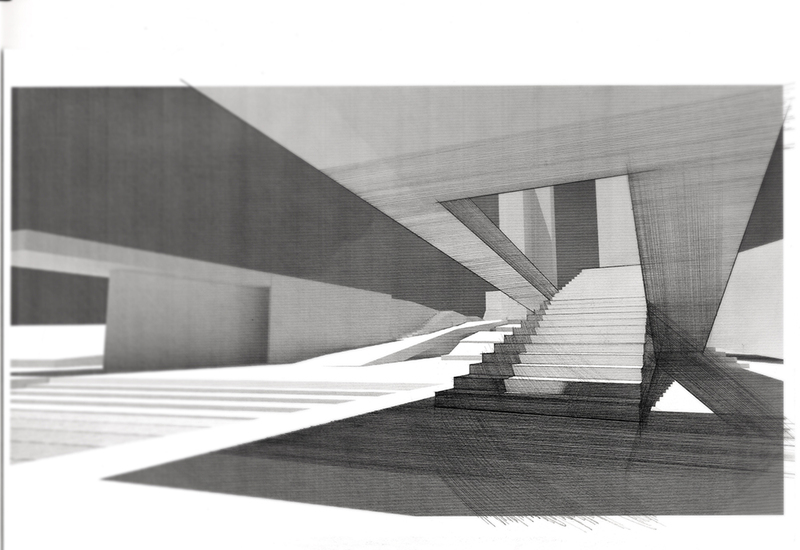 The fourth year design studio appropriated the line of the BIG project as a site. 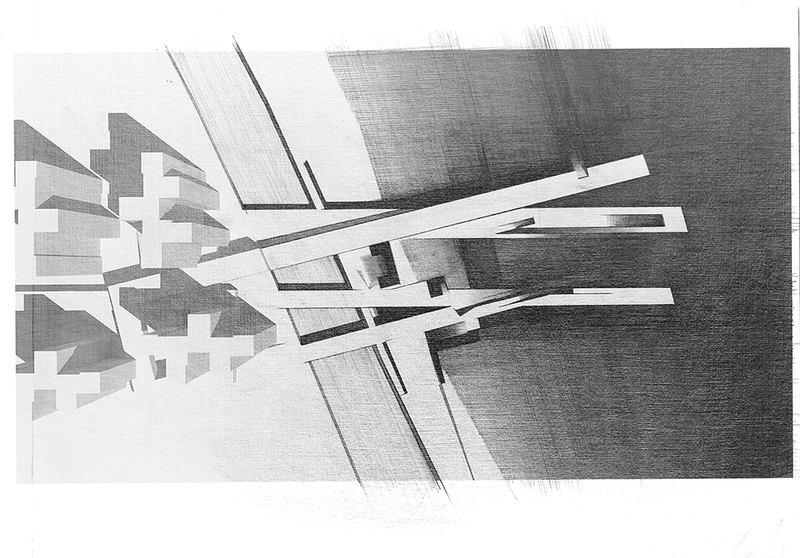 Each student was required to develop a portion of this line, articulate a program and propose architectural manifestations of this new threshold. The first portion was a two-week exercise, undertaken in groups of four students, which produced a series of analytical physical models in section. 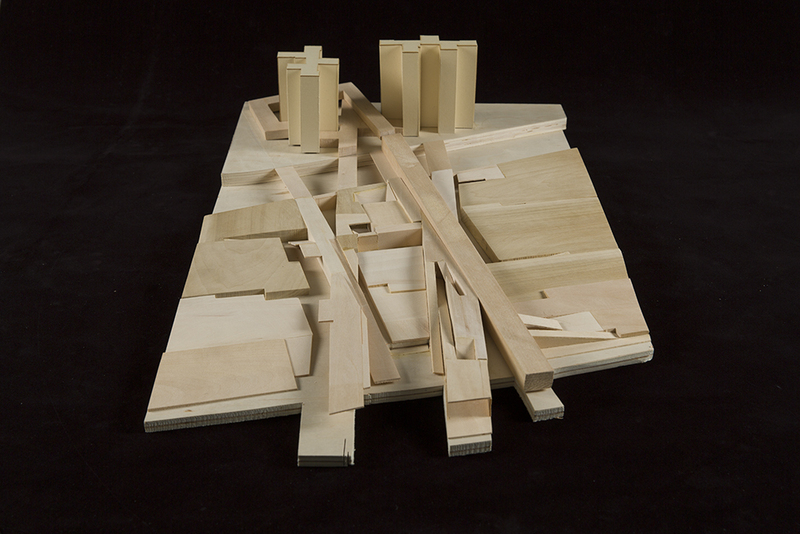 These were “operational models” to suggest ways of working on the site. Collecting and distilling the ideas that emerged from the first phase of the analytical models, a collective (across the studio) was developed through which ideas of interaction and interweaving of individual works were explored and a common vision of the elements and structure or transformation emerged. A definitive site selection was taken based on the strategies explored in the first phase. Individual projects were proposed and developed. 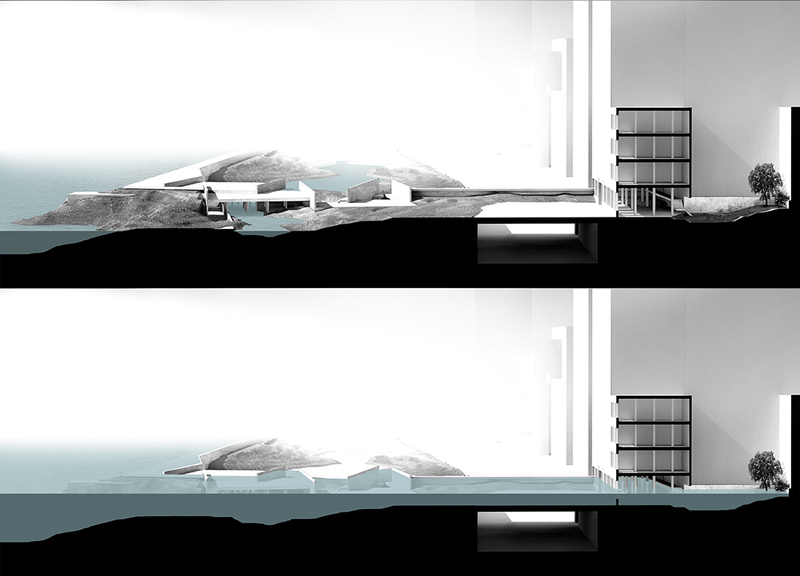 Projects operated within fields of non-specific boundaries, allowing the limits between proposals to be deliberately undefined. 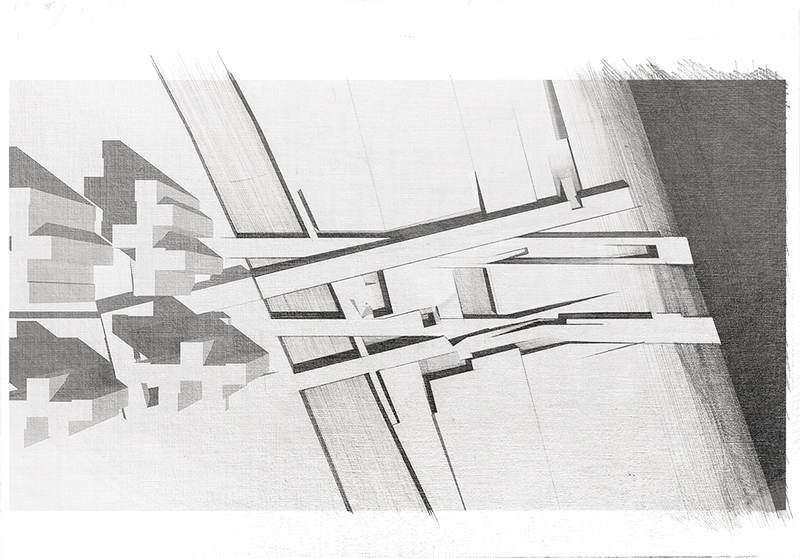 The studio aspired to discover new combinations of urban and architectural interactions. 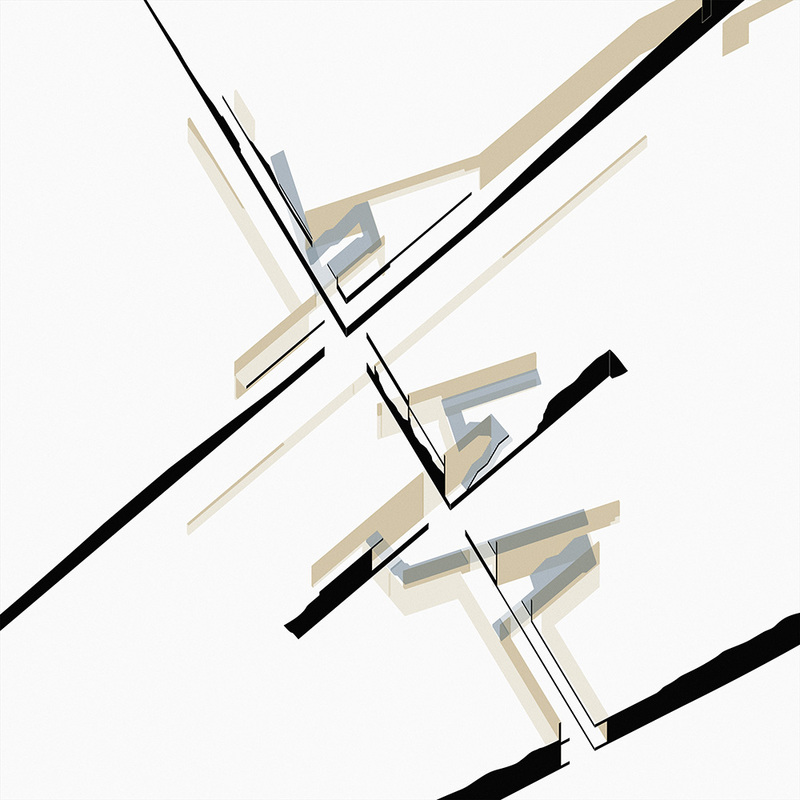 This way of working was both a response to the collective strategy and a negotiation with neighboring architectural ideas. Each project reached specific architectural articulation or resolution while responding to the overarching urban and landscape issues raised by the studio. 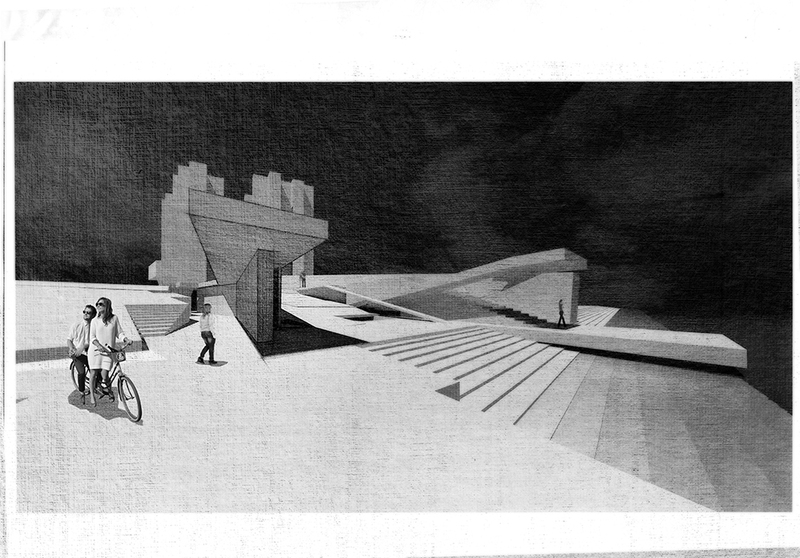 Plans, sections, elevations, models, and views described all the basic architectural ideas of the project. As recent events have shown, Manhattan is desperately vulnerable to rising water and increasing storm surges. 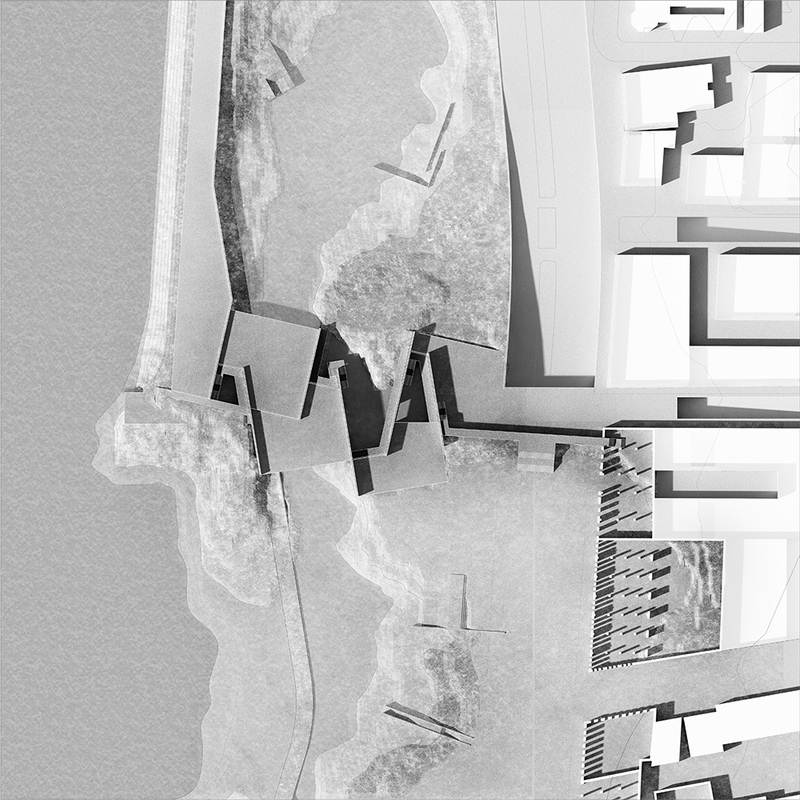 This project proposes a defensive edge that protects the city against these threats, while also seeking to rethink the relationship between landscape, infrastructure, and architecture within an urban context. A storm surge in Manhattan is an event that occurs on a rare basis. Protecting the city from such a surge requires huge interventions into the urban landscape. 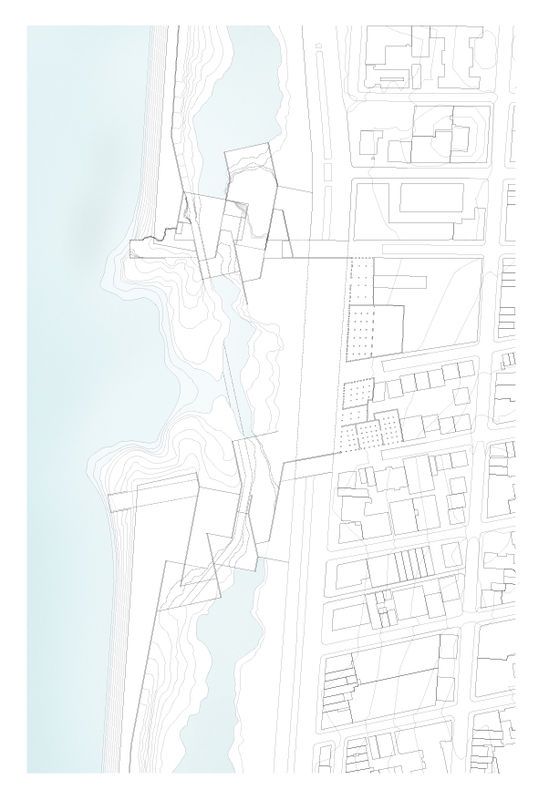 To explore the tension between the rarity of the occurrence of a storm surge and the large and permanent intervention it requires to protect the city, I proposed a transformation that is simultaneously interlocked with the existing urban fabric and physically removed from the city. 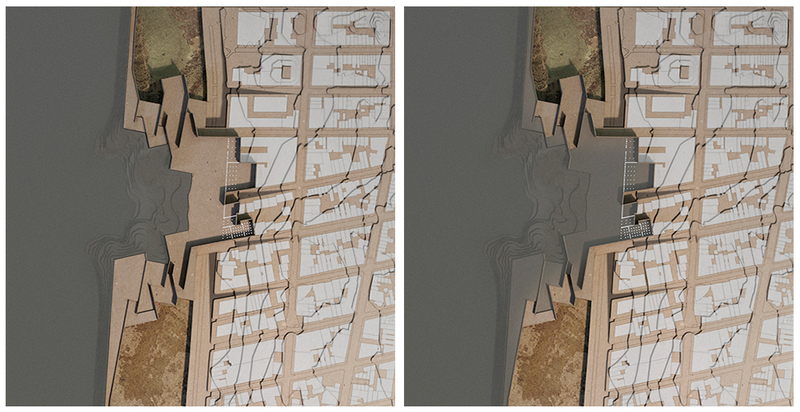 My proposal is prototypical, and can potentially be implemented anywhere along the edge of southern Manhattan. 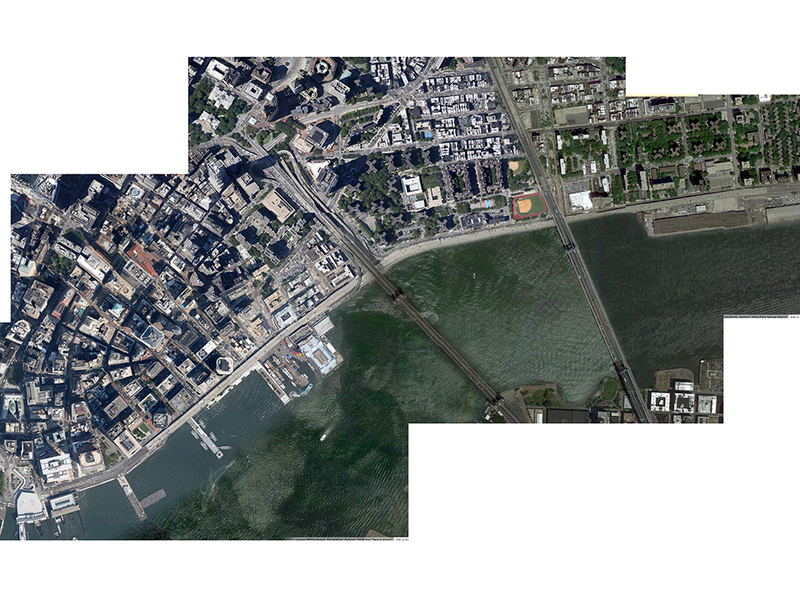 For the purpose of this study, I focused on an area on the West side of the island, around 11th st. 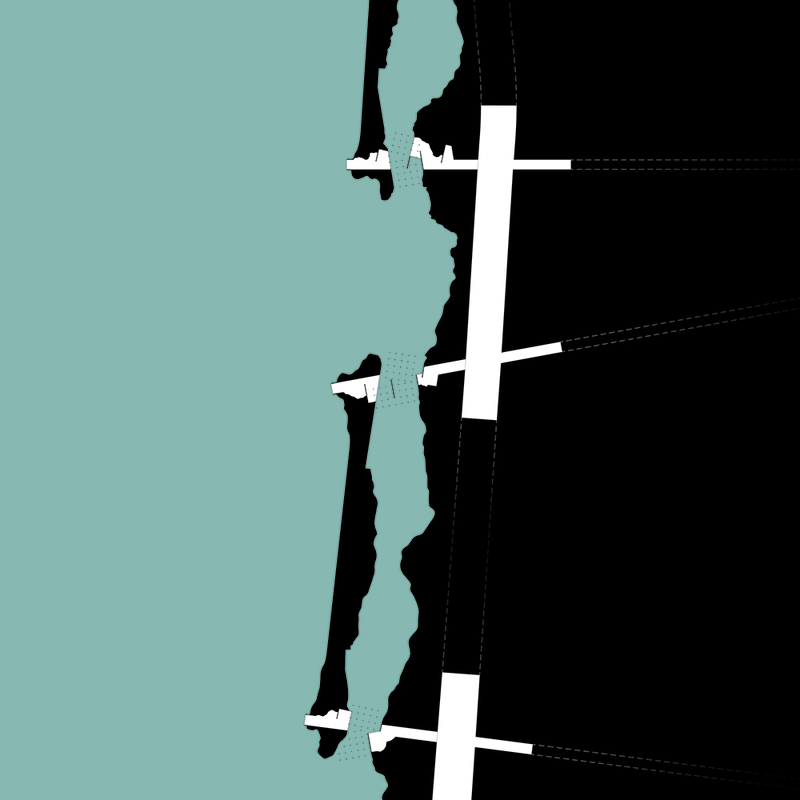 The main intervention consists of an offshore dike. 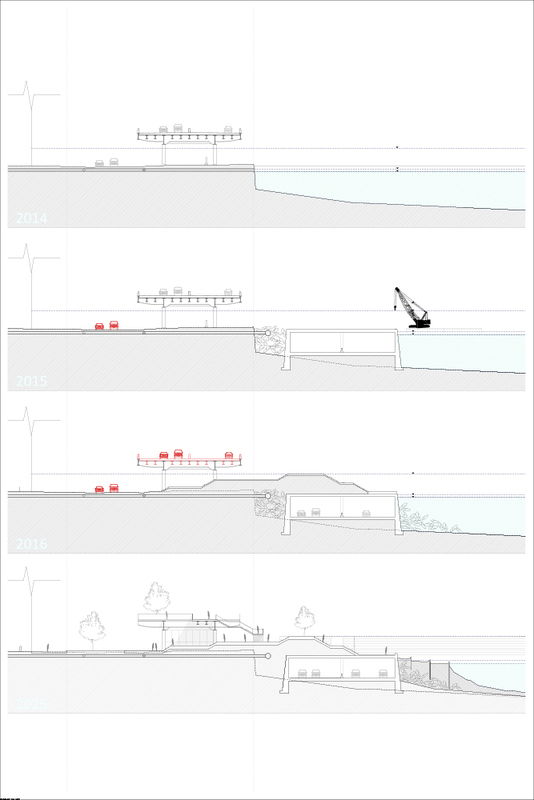 Placing the dike a few hundred feet into the river eliminates the need for a direct architectural intervention at the waterfront, but still creates change along the shoreline. In addition to the view across the river being obstructed by the dike, the water conditions between the dike and the shore change dramatically. Instead of the free flowing Hudson, this area now becomes a semi enclosed low water environment: an estuary condition where the tides will play an important role in the shaping of the landscape. 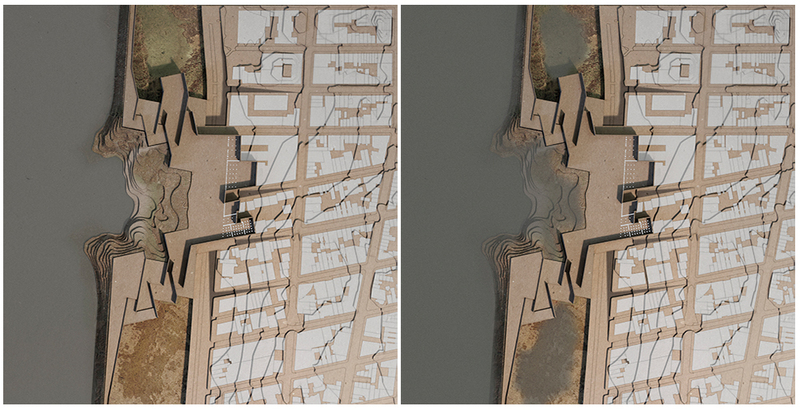 The hard edge of the existing shoreline dissolves into a more ambiguous transition from land to water. 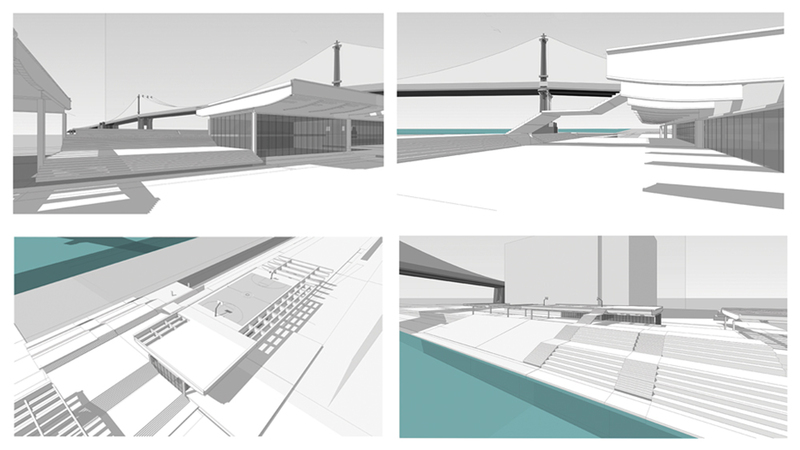 New viewpoints overlooking the other side of the river are generated as the dike ties back to the existing buildings situated at the waterfront. This creates a public plaza where the outward view is framed, as well as a public (interior) space at the ground level of the buildings. 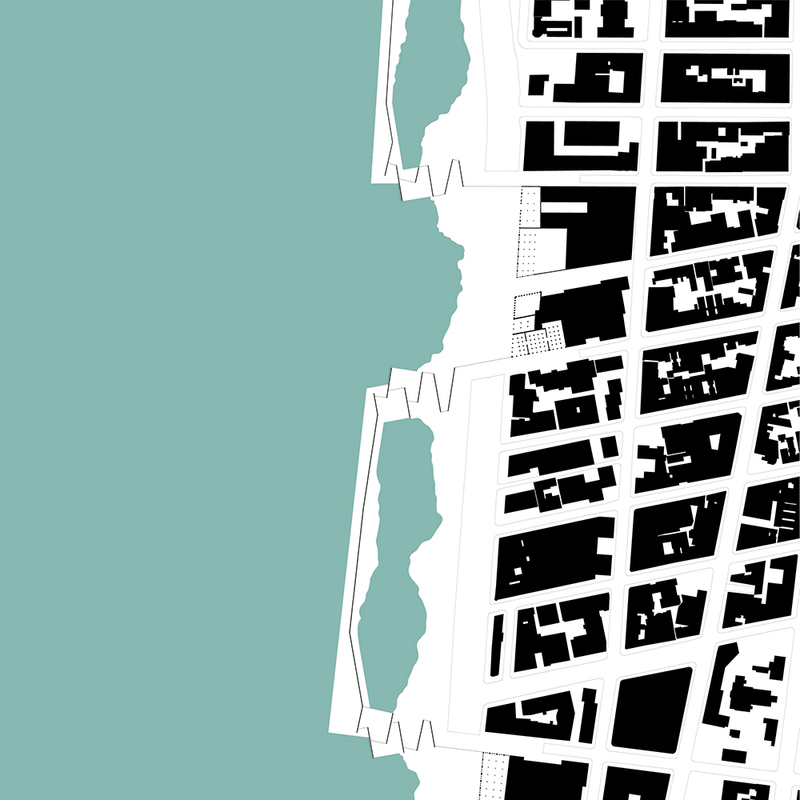 Taking advantage of the existing conditions observed on Houston Street in the East Village of Manhattan, NYC, a new datum is designed to accommodate and counteract the uprising sea level. This includes a water barrier along the FDR that prevents flooding. 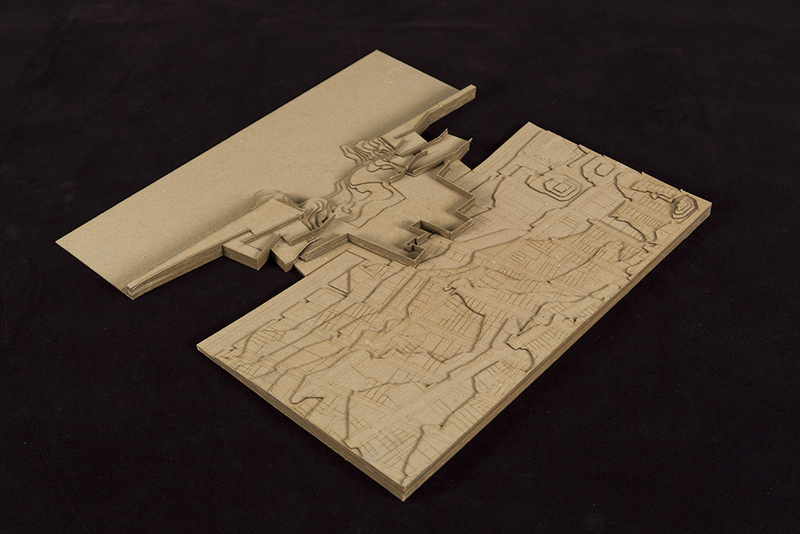 The new datum assimilates the entire site and transforms it into a landscape park. Outside and inside activities, solids and voids, soft and hard surfaces are interwoven; creating an amalgamated topography. 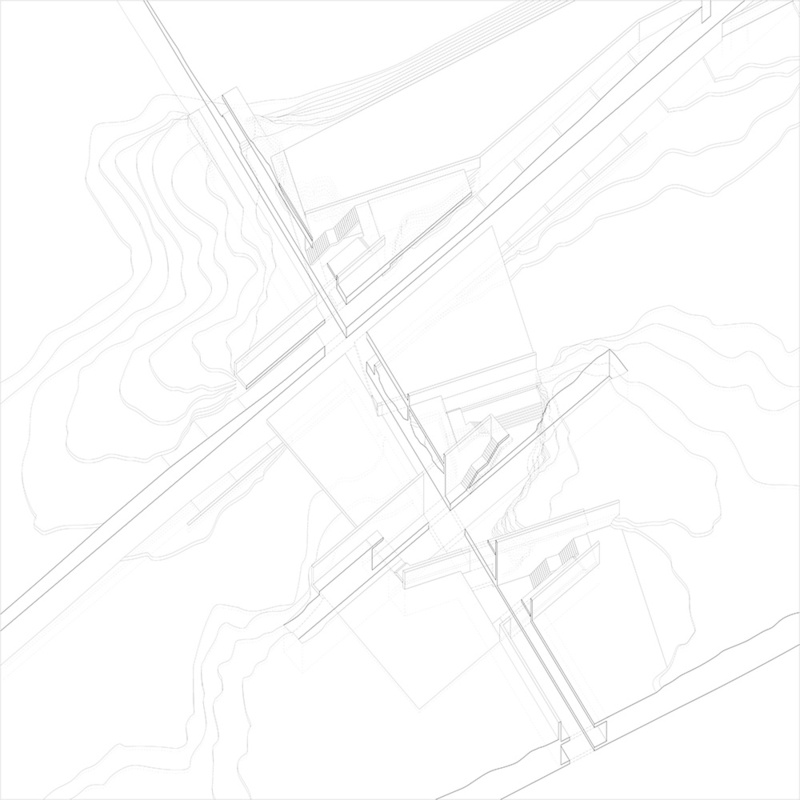 The design culminates by having initial objects from the grid diffuse into the landscape and act as a bridge between the programs, neighbors, circulation, and a range of activities. In the end, the green walkway datum activates a positive environmental and social aspect, improving the neighborhood. 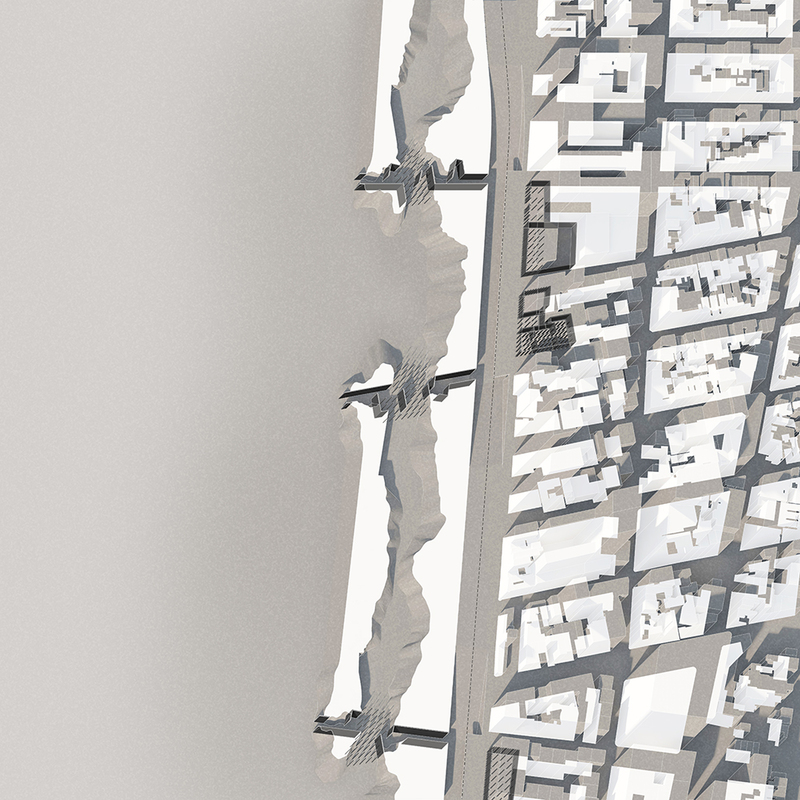 This urban scale project tasked the studio with providing a 17ft flood defense barrier around the southern tip of Manhattan. 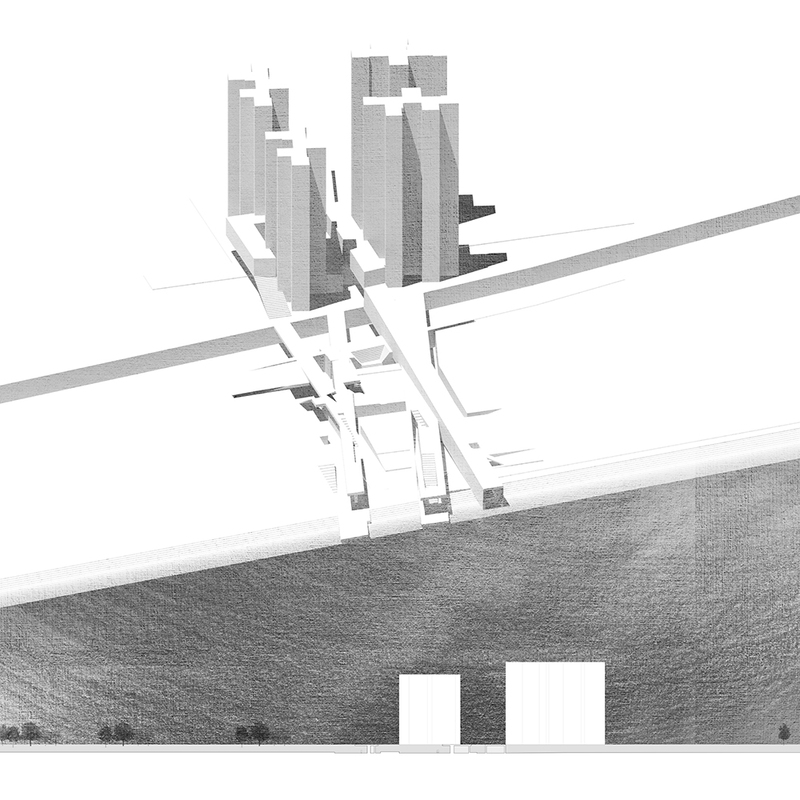 The design approach further extended the brief to challenge the existing stranglehold of vehicular infrastructure which currently provides a physical and psychological barrier for pedestrians on the east river. 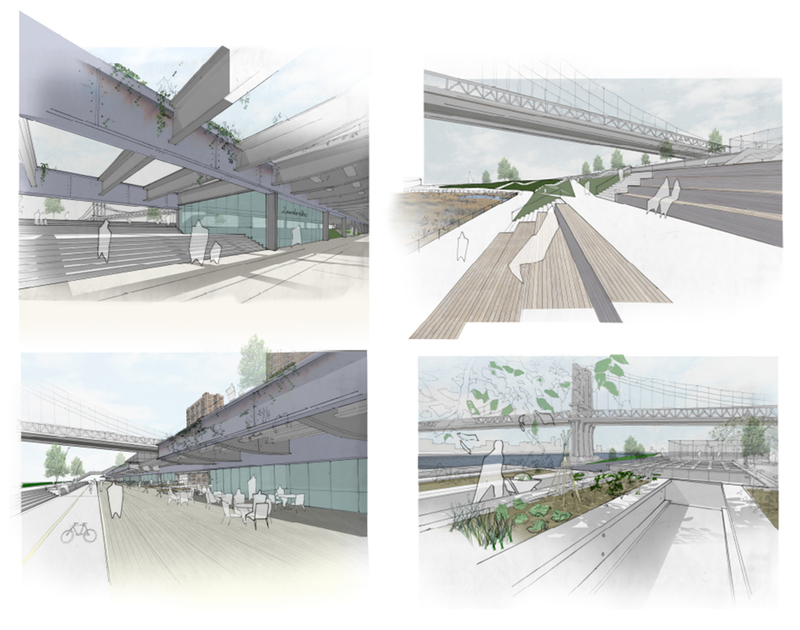 The obvious economic necessity for the barrier (given the Sandy financial repercussions) offered an opportunity to flip the pedestrian/car hierarchy of the FDR and a maximize a vastly underused and an astonishingly unloved public promenade. 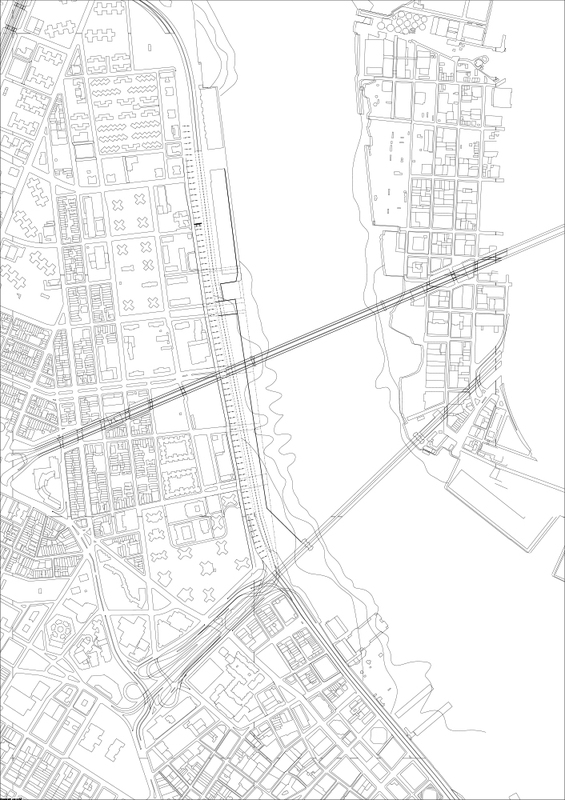 The site in the Lower side presented uniquely narrow existing sectional condition with just fifty feet between the existing city grid and the waters edge. 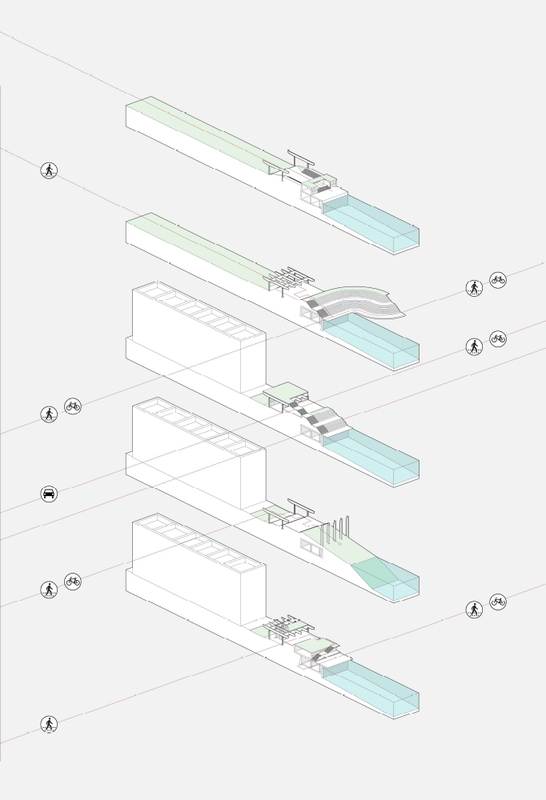 As the design evolved it became clear that to avoid the hostility of a dark and abrupt seventeen-foot flood wall, the infrastructure would need to extend into the river thereby allowing the possibility to construct a sunken (big dig style) ring road (sequenced to create minimum disruption to the much loved/needed vehicular bypass). The gentler gradient afforded by the riparian slop series of gentler thresholds conditions to provide a more pleasant pedestrian experience of the site. The decommissioning of the FDR would thus provide an industrial skeleton, strategically augmented and demolished to allow light into its deep undercroft and provide space to be colonized by a variety of public programmes.